Anthony Martial managed to find the net for United this afternoon, but his goal wasn’t enough to secure Mourinho’s men the three points. Manchester United hosted Stoke City this afternoon, as they tried to maintain their winning run. However, the Reds ended up experiencing their first draw of the season. Jose Mourinho fielded the same side as he did during United’s 4-1 win against Leicester last weekend. Captain Wayne Rooney began on the bench for Manchester United, as Chris Smalling took the armband and commanded the team from defense. Zlatan Ibrahimović started as Manchester United’s lone striker, with Juan Mata playing behind in as a No. 10. Jesse Lingard and Marcus Rashford were deployed on the wings. Chris Smalling and Eric Bailly started in the heart of United’s defense while Antonio Valencia and Daley Blind were named full-backs. Paul Pogba and Ander Herrera partnered in front of the defensive back four – a duo welcomed by the United fans. Anthony Martial opened the scoring for Manchester United 2 minutes after coming on for Jesse Lingard. However, 13 minutes later, Joe Allen equalized the scores after capitalizing on a mistake from David De Gea. Wayne Rooney hasn’t started during Manchester United’s past three matches, which indicates that Jose Mourinho is slowly beginning to phase the England man out of the squad. It looks like Jose has managed to do what David Moyes and Louis Van Gaal were afraid of – dropping Wayne Rooney. Rooney’s best days are clearly behind him, and it’s time Manchester United find an heir to his No.10 role. Juan Mata has so far impressed in the No.10 position, and looks to have a cohesive bond with Zlatan Ibrahimović. Marcus Rashford is also a potential candidate to fill in Wayne’s shoes, but it seems Mourinho prefers playing the 18-year-old on the right wing, although Anthony Martial’s return to first team football may see some shuffling around the squad. When Jose Mourinho was announced as Manchester United’s manager, Juan Mata was believed to have been on his way out due to the pair’s previous relationship. Many identified Mourinho as the reason for Juan Mata’s departure from Chelsea, and assumed the same would happen as the Portuguese took over Manchester United. However, as United prepare for future without Wayne Rooney, Juan Mata looks to be a promising candidate to fill in the skipper’s gap. Since Mata joined Manchester United in 2014, he has been constantly played on the right wings or right midfield, despite the player himself admitting that a No.10 role brings out the best in him. Juan Mata played as an attacking midfielder at Chelsea, but Mourinho was the man who began benching him due to his lack of defensive runs. Wayne Rooney was the reason Mata wasn’t allowed in the CAM position, but the Spaniard seems to have already moved above Rooney in the pecking order. 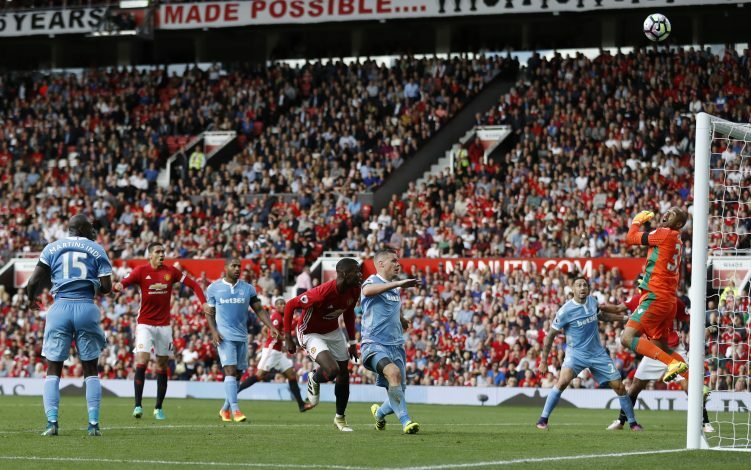 Anthony Martial scores his first… of many? Anthony Martial opened the scoring his afternoon, only 2 minutes after he was substituted on. The Frenchman came on for Jesse Lingard. His pace and agility proved too much for the Stoke defense to handle, before he finally curled one in, to score the first goal of the match. Martial scored 17 goals for Manchester United last season, after his mega-money move from AS Monaco. He soon became a fan favorite, and lifted United through most of the season. His most notable performance was his Manchester United debut, when he came on as a late substitute against rivals Liverpool. He took on the Liverpool defense and managed to get score United’s third and final goal of the match. Primarily a striker, Martial enjoys taking defenders on due to his immense pace. However, Mourinho would rather apply the youngster’s pace on the wings. He has so far been starting on United’s left wing. With Wayne Rooney on his way out, Martial’s pace and attitude would be perfect to ensure United’s attacking presence. United had many opportunities to seal the three points, but the team will be disappointed with the amount of chances they missed this afternoon. Their poor finishing hindered them from ending the game, and as a result, they were forced to drop two points. Zlatan Ibrahimović was the man who was trusted up front, but it’s clear that although the 34-year-old is in form, he can’t do it alone. If Manchester United are to climb up the table this month, they will have to display more clinical finishing. The Red Devils will take on Liverpool, Chelsea, and Manchester City this month, as Jose Mourinho continues to prove his worth as United manager. Jose Mourinho should implement a few more shooting drills, and allow players like Pogba to enter the box. The Frenchman has so far had a rocky start to his Manchester United career, which now seems to be going uphill. the midfielder’s shooting power and accuracy are exactly what Manchester United need at the moment. During United’s last Premier League match against Champions Leicester City, the Red Devils had the match done and dusted by half-time after scoring 4 goals. Mourinho needs to use that match as a building block for the rest of the season. No doubt the 18-year-old has been in phenomenal form for Manchester United, but the fans need to realize that he’s still a teenager and the whole team can’t rest on his shoulders. United need to rely on more than the youngster to pull them through the season. Rashford has so far scored 4 goals this season from 8 appearances, and the United fans seem to be relying on the youngster to win them matches. Since breaking onto the scenes last season, Rashford has become a favorite among the Old Trafford crowd, and looks set to become one of the all-time Manchester United greats. Rashford’s versatility and pace will come in handy for Jose Mourinho, as he continues phasing out Rooney. We can expect to see a lot of Rashford this season, but it’s important not to put all hopes on his shoulders.